Letter to Julia C. Stevens from Martha Berry informing her that she was sorry she could not see her the last time she was in New York because she was unwell. She does say though that she wants to visit her in New York again soon and that she enjoyed having her lovely car and chauffeur when they went to the flower show. She also states that she enjoyed being with her friends while in New York as well. She states that the schools are facing a tough time at the moment and that they are having to send students home for a lack of money. She has hope that help will come soon. 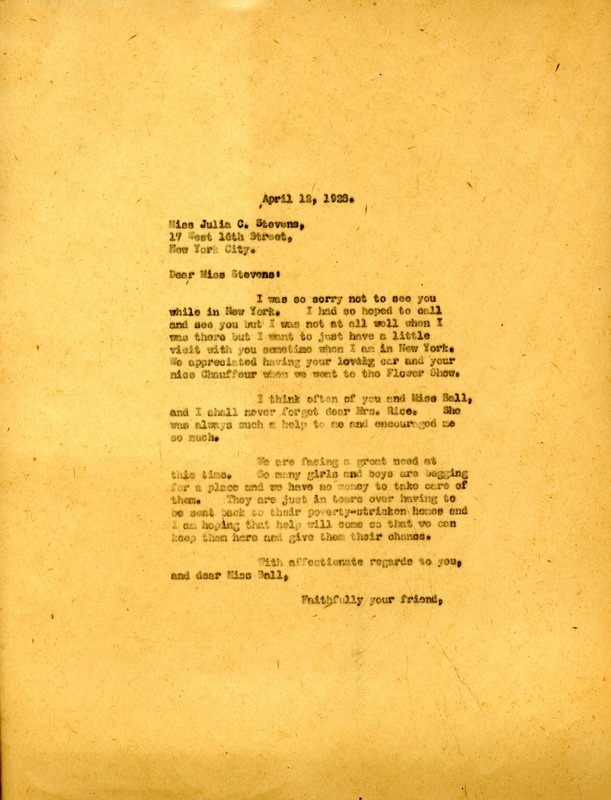 Martha Berry, “Letter to Julia C. Stevens from Martha Berry.” Martha Berry Digital Archive. Eds. Schlitz, Stephanie A., Haley Fortune , et al. Mount Berry: Berry College, 2012. accessed April 20, 2019, https://mbda.berry.edu/items/show/9035.